Here is the proper response to the title above: “Are you effing kidding me?” That has been my reaction when seeing THE NEXT PRESIDENTIAL ELECTION seeping into many discussions of politics right now, on TV and in print. Didn’t we just inaugurate this president a few days ago? MSNBC pundits and guests seem the most addicted to jumping ahead to 2016. Not all of them, but Chris Matthews was positively drooling even prior to the last vote at the prospect of an H. Clinton vs. Chris Christie contest. Chuck Todd’s Daily Run Down often speculates on that next big election day, too. And their sickness is contagious. They call themselves the “place for politics” but they should call themselves The Great Race Place. 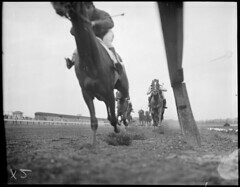 I’ve spent a few decades involved in horse racing, so I’m familiar with gambling addicts. These people are similar, but instead of gambling, they are addicted to the race itself. Having the big early favorite in their stable, Hillary Clinton, juices up their excitement. They love comparing her chances with, oh Joe Biden I guess among the Democrats, but more so vs. several potential Republican rivals whose every action is evaluated in terms of their jockeying for position in that NEXT BIG RACE. I have a few words to say about the matter, which might add to your irritation, but then I’ll shut up for two years, or so, unlike so many others. If Obama’s second term is judged to be more positive than negative, and if Hillary wants to run, she very likely wins. No surprise there. If for some reason she doesn’t run, then the race opens up among Democrats and the door opens for Republicans. Chris Christie is the big horse in the Republican barn, and I’m not referring to his size. Though he’ll need some skillful navigation through the wreckage of his own party, elements of which would rather be right than elect a President( “right” as in far right). In a country hungry for a politician who doesn’t envision a focus group reaction before every word he says, Christie is unique and could give Hillary a good fight if nominated, especially if bad things happen over the next four years that Democrats can be blamed for. As for the other potential Republican candidates? I don’t see Paul Ryan at all. His plan to balance the budget by 2040 didn’t make sense and now he’s talking about balancing it by 2023, without new taxes. What? Also, consider this: No VP candidate in a losing race has ever become president. My guess is that Christie sensed this if he did not know it. Jeb Bush’s name is often tossed around and he was an effective, popular governor with sensible thoughts on an immigration policy, not to mention fluent in Spanish with a Latina wife. All that could help with a needed boost in the Latino vote. Maybe in four years he won’t seem like one Bush too many. Our American inclination towards amnesia as to unpleasant pasts could help. If Christie upsets enough big donors and others on the right, Jeb’s stock would likely jump up. Governor Bobby Jindal says some good things, but his record in Louisiana conflicts with them. Also, if you recall, he bombed giving a Republican reaction to a presidential State of the Union message awhile back and I can’t see him in the top spot now. Not yet. Senator Marco Rubio maybe, but he needs to show more, like help shape an immigration policy both parties can buy. Unlike potential rival Rand Paul, he asked some good questions in the hearings with Hillary Clinton on Benghazi, so perhaps the chatter about his rising star status has some validity. I’m not convinced yet, though again, if Christie takes a tumble, he along with Jeb seem likely to benefit most. So, that’s basically all you need to know right now about the next Presidential race. Unless some surprise candidate pops up and picks up steam. Here is one long shot. Suppose Hillary doesn’t run, Joe Biden would be an OK Democratic candidate but no shoe in, so how about a real surprise: Cory Booker. He is going to run for the Senate and if he wins and does a few things to catch attention there to build upon his reputation as a popular Newark mayor, who occasionally turned super hero, saving a citizen here and a dog there…??? A contest between the Jersey boys. The press would eat it up. Maybe the crew from Jersey Shore would get press credentials, too. 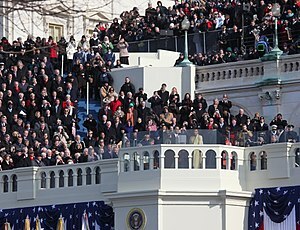 And whoever won, Bruce Springsteen would still play at the inauguration in the spirit of togetherness. You never know. Who was Barack Obama back in 2004, four years before the election of 2008? Continuing in the spirit of self-preservation, the Republican controlled House allowed a vote Wednesday to suspend the debt ceiling limit until May. Perhaps they are catching on to Louisiana Governor Bobby Jindal’s recent advice: “We’ve got to stop being the stupid party.” Exactly how they are going to do that remains to be seen, but at least they are avoiding general enmity for the moment. They are still holding the debt ceiling hostage, but are at least giving “him” food and water for a few months. Other fiscal shinaningins will take place between now and then, but they can wait while we try to better understand the tug of war since it is likely to continue throughout this presidential term. As much as I don’t want to study the matter, and you probably don’t want to read about it, I feel compelled to for the simple reason that our inability to develop a fiscal path forward seems likely to sink us in upcoming decades, if not right to the bottom than leave our deck stranded along the water line. To build a context for this debate, I suggest first looking at the seven minute video below by David Wessel, economics editor of the Wall Street Journal. His portrayal undoubtedly has critics from the left and right, but his outline of the issues has been praised by moderates on both sides. While ostensibly focusing on the fiscal cliff, his points are relevant to the whole deficit/debt issue in terms of providing an overall snapshot. He states a number of facts that I find illuminating, which is what facts should be, of course, but these days they are more often manipulated to obscure like peas in a shell game. A case in point. During the third presidential debate, Mitt Romney made a point that we have less ships in our navy now than in 1915, as if that meant anything. Obama’s derisive response stemmed from the fact that Romney was implying that it did (*1). The number of ships we have is not important; their collective fire power and relative dominance is. In that regard, “today’s navy is bigger than the next thirteen combined.” Now that is an illuminating fact in contrast to Romney’s misleading one. And the light source just happens to be David Wessel’s book Red Ink: Inside the High-Stakes Politics of the Federal Budget. The book, by the way, is only 162 very readable pages. If you read it, your expertise on these matters will largely match my own. (*1) Part of President Obama’s irritation with Romney’s point about the navy’s size in 1915 may have stemmed from his apparently cribbing the line from Obama’s own Defense Secretary, Leon Panetta, who in defending the Defense budget had given the same misleading statement to Congress. (Red Ink, p. 90). I watched the inauguration on TV while doing chores around my place, and caught most of his address. Most of what he said he hoped to accomplish included a swipe against positions the Republicans have taken, like arguing that the dangers of climate change are just one more liberal over reaction. Obama’s response: No more Mr. Nice Guy. No hands reaching across the aisle, but a fist. I have never seen it explicitly stated, but the plunge into recession just as Obama was taking office made any kind of real cooperation virtually impossible, because the two parties had contrary approaches to deal with the crisis. The Democrats believed that since business was not spending, government needed to in order to boost the economy, hence the stimulus package. Meanwhile, the Republicans…..well I’ll stop here, because I do not see a clear line between Republican rhetoric that blamed Obama for everything and an actual belief that tightening the budget would help us out of the recession. There are conservative and/or libertarian economists that argue for austerity as the way to go, but this is a tricky business that I will explore at a later time. The point here is that when two people, or two parties, reach a fork in the road, there is no room for compromise. One either takes one fork or the other, and that is the situation Obama faced in his first term. Along with a difference in basic beliefs, the Republican party was undergoing an identity crisis. The party’s combination of Neo-cons, social conservatives, fiscal conservatives and libertarians (who are a unique breed of conservatives who in some cases agree with the far left) are not the sort open to compromise The moderates who used to guide the party now tend to be painted by the rest as Republican in name only (RINO’s). The one thing that united this disparate group was a common desire to get rid of Obama. Hence, the circus clown act of unlikely presidential hopefuls who interchangeably jumped up and then fell on their faces . Romney got the nomination simply because he was the least unacceptable candidate to the most Republicans. Well, that collective strategy failed to replace the President, and since the election the Republicans have resembled a collection of episodes of “Family Feud”. Though I don’t recall the source, I heard John Boehner say the other day: “We cannot be the party of “no,” suggesting that he finally got the point after four years. He showed what he meant when allowing votes to be taken on the mini-fiscal deal and federal aid to Hurricane Sandy victims in the House, even though a majority of his own caucus would not support them. In other words, he allowed votes he knew he was going to lose. This is the kind of leveraged bi-partisanship we are likely to see in upcoming months, to the extent we see any. The President feels he has the upper hand and, unlike most of his adversaries, he will not worry about being reelected. If the Republicans are not going to continue being the party of “no” they will have to divorce themselves from the Tea Party crew, who do not seem capable of being reasoned with. This should be interesting to see. The prospects of a Republican party in shambles probably makes most liberals feel a bit giddy, but I believe in the need for checks and balances in all relationships, personal and professional as well as in government and between the two parties, so I would prefer seeing Republican moderates reclaim the soul of that party and become an active force to help get things done again. I think Governor Chris Christie might be able to lead them in that direction. Or maybe I just like the fact he answers reporters’ questions instead of dodging or deflecting them. Can you believe it? A politician who often says what he actually thinks. Reducing Gun Violence: What Will Work? Don’t ask me. I only know that Wayne Lapierre’s NRA vision of armed guards on every corner is a bad idea as I argued in my previous post. Trying to digest all the elements involved in reducing gun violence makes me feel sick. It is like trying to eat a huge meal when you are not even hungry. Only one thing seems clear. We have two fundamentally different approaches to reducing gun violence. One represented by the President relies primarily on background checks, research on gun violence and gun restrictions. 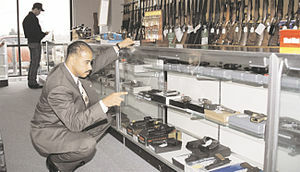 The other represented by the NRA’s Lapierre relies on more guns and less restrictions on their availability. I think of it as a return to the wild west. I know, these more guns are supposed to be in the hands of “good guys,” but since Lapierre is against background checks, how would we have a clue who is who? The NRA has quietly been winning this battle of beliefs for a couple of decades – prior to the Sandy Hook massacre polls showed an American inclination for less gun control not more – and without the uniquely powerful reaction most of us had to six and seven year olds riddled with bullets that day, we wouldn’t be having this discussion now. The NRA has successfully worked for years nationwide like termites in the wood work to push their “free the guns” agenda in state governments, city councils and of course Congress. From this perspective one can see why they accuse Obama of offering a “radical” response to this recent tragedy. It is radical to them because it opposes all the gains they have made in the opposite direction. Right wingers like Rand Paul are saying Obama has a “king complex” after he issued numerous executive orders related to gun violence the other day. One of the king’s decrees was the radical step of authorizing the Center for Disease Prevention to do research in this area again, including the impact of video games and violent images, which I imagine Rand Paul would like if the research was restricted only to the last two topics. And Obama hadn’t suggested it. Back in 1996, the NRA managed to marshal enough congressional support to forbid the CDC from doing any more studies on gun violence. Apparently they did not welcome studies with conclusions like this: “Homes with guns had a nearly three times greater risk of homicide and a nearly five times greater risk of suicide than those without, according to a 1993 study in the New England Journal of Medicine.” (Slate). In short, while the NRA acts like President Obama has declared war on gun owners, in reality he is finally mounting a defense of common sense gun laws steadily eaten away by the NRA for years. The NRA has staunchly and steadfastly defended their positions. This is not a battle easily won, but a war that will be fought over time. It remains to be seen whether the spirit of Sandy Hook will prove equal to that of those who feel any kind of restrictions on what they deem their gun rights is a mortal sin. The Biden Commission gave several recommendations to reduce gun violence to the President yesterday and I doubt any of them will please Wayne LaPierre, the NRA’s executive vice president. As you probably have heard, his plan is more simple and direct: The only way to stop a bad guy with a gun is a good guy with a gun. His idea is to put a well trained good guy guard with a gun in every school in America. This is a textbook example of the notion that for every complex problem there is a simple solution – and it’s wrong. If you think about it, it’s also absurd. I admit, the thought of being defenseless before a vicious shooter grabs my gut and makes me want to have a gun. And the thought of having children in a school defenseless before such a killer makes me want to put a “good guy” with a gun in that school. However, even if that sounds good, reality is more complicated and likely to get in the way. For one thing, the good guy might panic and do more harm than good. In violent conflict mistakes are made. In the military it’s called death by friendly fire. Even if well trained, a security guard in most schools is not going to be ready to do battle like a tactical squad member or even a regular policeman. He or she is not likely to be ready to handle the sudden onslaught of a killer out of nowhere. After all, the vast majority of schools have never experienced this kind of violence and are not likely to, so how would the guard keep his or her edge? There have been less than 400 shooting incidents in American schools at all levels over the past 20 years, a large majority with only one death or injury. Just for a point of comparison, over that time we’ve had between about 85,000 and 100,000 public secondary and elementary schools leaving aside post secondary and private schools. That means that even as things have been, well over 99% of our schools have never experienced this kind of tragedy over the past 20 years, and only a relative few of them had guards. Under Lapierre’s plan we would need to hire at least 100,000 guards at – what? – maybe they’ll work cheap out of public spirit – so we’ll pay each 30k. Isn’t that three billion dollars a year? If we are going to spend three billion on measures to reduce gun violence, is this what we want to bet our money on? Even if we already had all these guards in schools, do we really have much sense of what good they would do, since only a small fraction would have faced an attacker? Take Columbine High School as a case in point. It illuminates how messy reality can get and how hard it is to assess the value of having an armed guard. 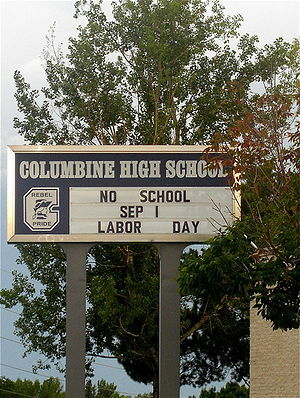 Columbine had an armed security guard assigned by the Jefferson County police department when Eric and Dylan, the two classmate killers rampaged through the school. If that security guard had been at the “A”-period school lunch per usual, he might have had an impact on stopping them… Maybe. On this day, however, he didn’t like the teriyaki on the menu, so he went out to get a sub instead and was eating in his car outside when all hell broke lose. He acquitted himself well exchanging fire outside with the two boys who had hoped to blow up the school and watch the show from their cars. The problem was their many homemade bombs largely fizzled. So they went in with their guns while exchanging fire with the guard. It has been argued that the boys might have done even more damage without that armed guard there. That seems reasonable, but not in keeping with the facts. From my reading of Columbine, which thoroughly covers the event and people involved, the guard remained outside the building as did the police when they arrived employing a policy of containment. What stopped the boys from killing more is their suicides, not the guard and not even the police, who were criticized for not entering the school sooner. By the time the tactical squad members actually found the boys they had been dead for about three hours from self-inflicted wounds. Of course, if the lunch special was different that day and the armed guard was in the cafeteria per usual, he may have saved lives, but the key word here is MAY. He may also have been gunned down, or in the confusion might have shot innocent kids. The place was pure chaos, with smoke and fire from partially exploded bombs and most of the kids and staff in total shock. This would not have been clear cut like the gun fight at the OK Corral. Once you replace Lapierre’s probability – a good guy with a gun will likely help – with the notion of various contingencies that reality might fling at us, you begin to see anything might happen. Whether there is an armed guard on duty or not. The killers’ plan wasn’t to mow people down in the school with their guns. The dud bombs were to be the main event. They placed close to one hundred of them around the school. Fortunately they didn’t wire them right. The guns were to finish off those who survived the bombs and themselves. The power of Wayne Lapierre’s vision is that we feel better when we imagine a good guy with a gun at least having a chance at stopping the bad guy (most mass shootings are done alone). It makes us feel we are doing something to protect our children, but having background checks and restricting the sale of semi-automatics and large magazines would be doing something, too. In the Columbine case, background checks and restricted sales may have made a bigger contribution to reducing violence than the guard, as three of their four weap0ns were bought at a gun show with no questions asked. Or the boys might have obtained more guns elsewhere. But, again, the armed guard turned out to be no sure thing, either (*1 ). In conclusion, let’s imagine Lapierre’s best case scenario over time. Let’s say we hire a guard for all the schools that don’t already have them (though of course schools who do already have them would get money, too). And these guards acquit themselves amazingly well, like commandos repulsing the relatively small number of vicious invaders. Will we celebrate then? Don’t you think future killers will see that and pick off the kids on buses or in parks or shopping malls? They don’t have to go into schools to find plenty of kids to kill. Kids are everywhere. Lapierre’s full vision leads to placing armed guards on almost every corner. Is this the future we want for America? One based on an illusion, perhaps even a delusion, of security. (*1) It seems the best chance of stopping these killings was for the police of Jefferson County to follow up on complaints that Dylan was threatening to kill a former friend and that he was making bombs. Thirteen months prior to the slaughter, an affidavit was filled out but a search warrant for Dylan’s house was never issued. That seems to remain a mystery according to the author of Columbine, Dave Cullen. What isn’t a mystery is that local officials covered this up for nearly five years in classic “CYA” fashion. My thoughts are percolating regarding upcoming posts as well as reorganizing those pages listed across the top which I have done little with so far. Reorganization probably will mean I will erase most of them and pray that some day I will have more time to build up a reserve of illuminating political/economic information there. So, today I suggest you look at Nate Silver’s blog, which is also listed on my Blogroll to the left for convenient access in the future. For those who are unfamiliar with Silver, he first gained public recognition for developing a computer analysis for forecasting the performance and career development in Major League Baseball (stuff related to the movie Billy Ball). Later he became famous doing a great job in presidential picking in 2008 and again in 2012 (a perfect 50 out of 50 states). In this post Silver is interviewed by some one who asks questions about the election, sports, public policy and some miscellaneous ones at the end. If you flip through it I think you’ll find an interesting thing or two or three. He took Notre Dame against the spread? What an idiot! Last year, 2012, my posts were largely about the presidential election and/or the nature of our political scene which has been aptly dubbed an era of “post truth” politics. Now I am considering themes to form a topic list for 2013, and I plan on describing them in an upcoming post. Not surprisingly, continuing to separate truth from layers of falsehoods and distortions will be one of those themes, while the question of political polarization and Congressional gridlock will be another. I will address the debate over gun violence as well. Speaking of the last-named topic, I picked up a copy of Columbine by Dave Cullen as background reading. Published 10 years after the event and dispelling many media distortions of that moment, it makes chillingly fascinating reading, much of the fascination tied to the questions: Who were these killers? How did they come to be? At times I read something written by a Neo Con or radical libertarian and I feel they have lost all contact with reality. Of course, those on the right have some figures on the far left they feel the same about. When it comes to politics, we Americans tend to live in one of two realities as drawn by either party’s operatives. One might say that from either end of the party spectrum, the opposite reflects varying degrees of psychosis. But the nomination of Chuck Hagel for Defense Secretary should not be a case in point. By what I would call centrist standards he seems an excellent pick, but not to Republicans like John McCain and Lindsey Graham, or Neo Con, so-called intellectual William Kristol (*1). Several years ago these guys were all pretty chummy Republicans, and Kristol even made a case for Hagel back in 2000 to be G. W. Bush’s running mate. Hagel’s sin is that in the interim he has acted like the maverick John McCain once was, and has expressed views that fit less and less with the ever more right trending Republican Party. And perhaps his biggest sin of all. He seems to like and respect Barack Obama. 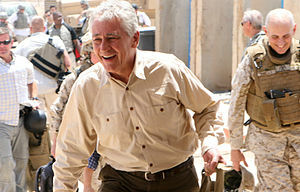 If RINO was in the dictionary, Hagel’s picture would be right next to it. If Republicans had excommunication, he would no longer be a member of that church. I think Chuck Hagel has not changed so much, but the Republican reality has and Hagel no longer fits in. From their perspective he has become a political psychopath. So, a guy who used to be thought imminently capable, while outspoken, is now painted as someone unfit to serve as Defense Secretary. I would say that’s crazy, but more likely it is simply pandering to the far right elements of the Republican party. If you haven’t heard already their criticisms of Hagel, you’ll hear plenty over the next couple of weeks or so, but here is what I believe is their biggest concern. Hagel has talked about the Pentagon being “bloated” in the past, even before he became ostracized. As a combat veteran himself, he is the perfect candidate when it comes to paring that budget down (*2). When he will argue that our military can remain dominant without this or that, no one will be able to accuse him of not caring about our troops in the field. The Republicans continue to clamor for deficit reduction, but not when it comes to touching their sacred Pentagon cow. Chuck Hagel will look for sensible cuts in the Pentagon budget, which is not something Republicans want to hear about. But Democrats do. (*1) William Kristol founded and is the editor of the Weekly Standard, which I would describe as a Neo-Con propaganda instrument. I overheard him say on FOX the other day that “Obama is not concerned about having a strong national defense.” I will address the absurdity of this statement in my next post, or one soon after. He was one of the early backers of Sarah Palin as McCain’s VP candidate, which in my mind largely dismisses him from the category of serious thinkers. He did come to realize that Palin did not really make a good presidential candidate in 2012 and recently he said he saw no reason for Republicans to live or die over raising taxes somewhat for the rich. I’ll give him a couple of points for making some sense for a change, but I group him among those who are so soaked in their ideology they douse most of what might otherwise be illuminating. Another topic to be addressed later. David, David, David…. I thought you were better than that. “Decline militarily”? Of the money spent worldwide on military forces, we spend about 42% of it. Put another way, our military spending is more than the next 17 countries in the world combined. Don’t you think there are probably some areas that could use paring down given our deficit problems? I will go into that more in my next post. Which will be short to compensate for this long one.